(Boston, MA, Oct.17, 2013) - The Hamilton Company today breaks ground on its newest residential property at 1085 Boylston in Boston's Fenway district. However, unlike other Hamilton Company developments, the net proceeds from the property will go directly to the community through The Hamilton Company Charitable Foundation. According to Jameson Brown, Chairman of the Hamilton Charitable Foundation and the son of real estate icon Harold Brown, the 30-unit residential building will generate in excess of $200,000 annually for the community organizations when fully leased. "We are very pleased to have the opportunity to be one of the first charitable organizations building market rate housing with the net profit of the development being put back into the community," said Jameson Brown. 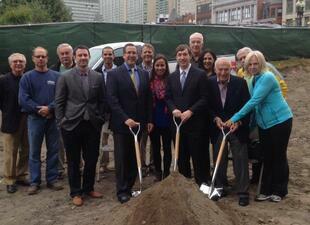 "This building will be a great addition to the Fenway neighborhood." Located near Ipswich and Hemenway Streets and The Berklee School of Music, 1085 Boylston Street will house 30, one-bedroom apartmetns, each averaging about 600 square feet. The development will have parking for 18 vehicles and is within easy walking distance to the Hynes MBTA station, Newbury Street shopping and the Prudential Center. Rents will average about $2,000 per month. Purchased in December 2011, 1085 Boylston Street, now a parking lot, will rise 6-stories and boast a "green roof", which will be accessible to residents. Its facade will be masonry and glass, and will complement other buildings in the neighborhood. Carl Valeri, President of the Hamilton Company, said the company has expended more than $130 million to acquire and develop property this year, adding to a portfolio which already consists of 5,200 residential units and nearly 2 million square feet of commercial property in and throughout Greater Boston. "We are fortunate to be in the position that we're in," said Valeri. "It's a great feeling to be able to share what we have with those organizations that extend a helping hand to others." Founded by Hamilton Company Chairman Harold Brown, The Hamilton Charitable Foundation has already donated more than $1.2 million to in excess of 50 community organizations and institutions of higher learning in the past 3 years. For 2013 alone, net proceeds to these organizations and institutions will total $600,000. What's more, The Foundation will continue to support community organizations and institutions for at least 20 years. "Without The Hamilton Company and Harold Brown, the landscape of the city of Boston would look much different than it does today. Harold Brown is an integral part of the fabric of this great city and he has made sure his legac will remain with us for a long, long time." Boston City Council Mike Ross said: "1085 Boylston Street, and the proceeds that it will generate to non-profit organizations, is a shining example of what commitment to a community is all about. Harold Brown should be commended for his unwavering love for Boston and for his great generosity."